Canadian auto sales grew 2% to an all-time January high of 110,945 units in the first month of 2017, boosted by a surge in sales of the top-selling Ford F-Series, Canada’s most popular vehicle in each of the last eight calendar years. Although the Honda Civic tumbled 10%, it maintained its podium position in January. But the Civic led a passenger car category that slid 5% compared with January 2016 and 8% compared with January 2015. Civic sales fell twice as quickly as the car market overall. But Canada is F-Series’ territory. 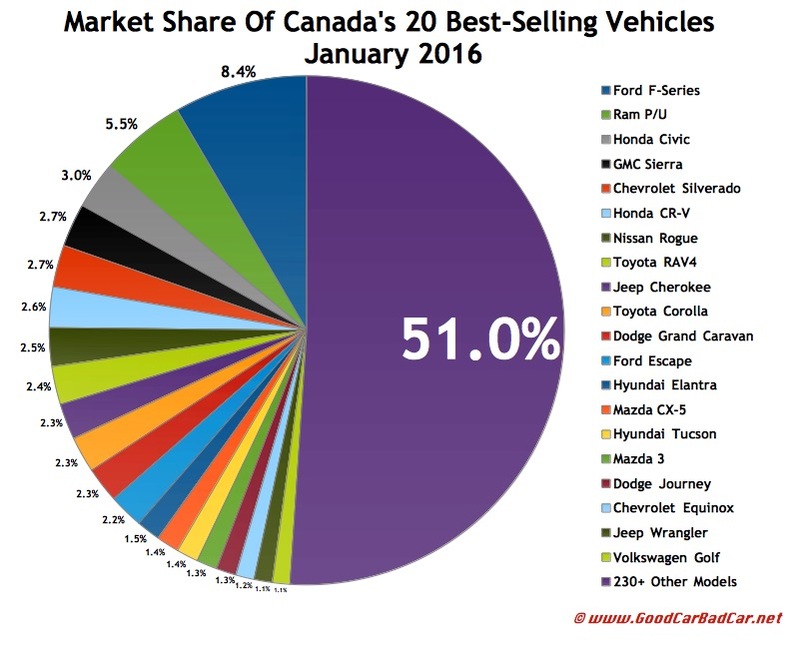 Ford’s most popular line of vehicles, with 9303 January sales, outsold every auto brand in Canada aside from Toyota. In fact, the F-Series outsold all other Fords combined, too. 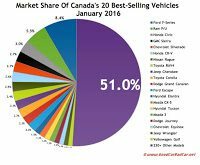 8.4% of the new vehicles sold in Canada in January 2017 were Ford pickup trucks. 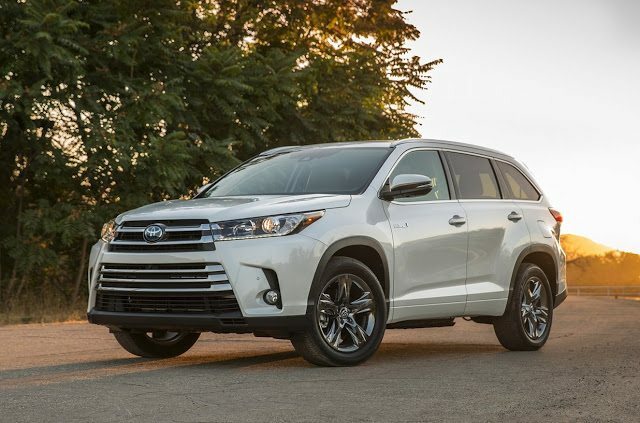 Compared with January 2016, this list of the 30 top-selling vehicles in Canada includes the Subaru Forester, Honda HR-V, Ford Explorer, and Toyota Highlander, four utility vehicles that weren’t on the list one year ago. We’ve already published January lists for the 20 best-selling cars, 20 best-selling SUVs and crossovers, and complete figures for every pickup truck, links to which you’ll find below. Throwing all those vehicles into one group results in this list of the 30 best-selling vehicles overall. We end up with four pickup trucks, two minivans, seven cars, and 17 utility vehicles. Historical monthly and yearly sales figures for any of these top-selling vehicles can always be accessed through the dropdown menu at GCBC’s Sales Stats page, and for those not viewing the mobile version of this site, near the top right of this page, as well. Mobile users can now thumb across the table for full-width access.